Official description It's the Mario Stars: Mario, DK, Yoshi, Peach and Bowser. For other similarly named event matches, see All-Star Battle (disambiguation). All-Star Match 1 (オールスター戦1, All-Star Battle 1) is the 10th event match of the 51 event matches in Super Smash Bros. Melee. As an available character of their choice, the player must play through five matches in succession and defeat five opponents, all within a time limit of four minutes. Each battle is a one-on-one match against a starter character from the Mario universe and its spin-offs (Donkey Kong and Yoshi). 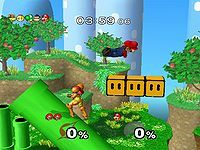 Each match takes place on a different Mario series stage. Opponents start with 1 stock each, while the player starts with two stocks. As is the case in All-Star Mode, the player's stock and damage percentage persist between matches. Icons representing the player's upcoming opponents and the order in which they appear are visible in the top left corner of the screen. Each stage transition occurs with a slow fade to black while the next stage loads. This page was last edited on March 17, 2019, at 00:21.